In addition to commemorating the historical strike of 1937, the performance also sought to foster dialog with members of the public about labor issues and workers' rights. 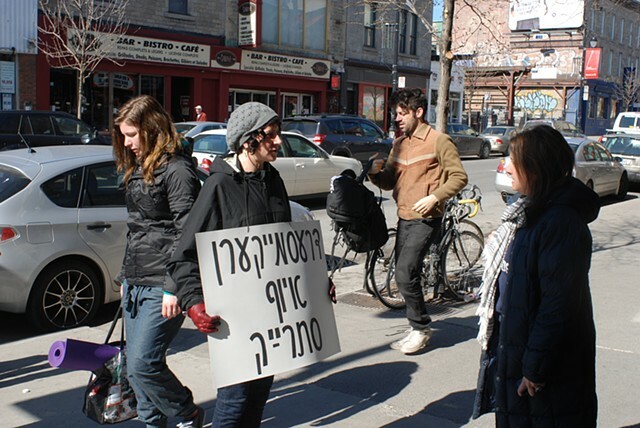 Many people wanted to know what this Yiddish-language placard said. This particular sign attracted interest and interaction from a wide range of people: Hassidic Jews, students, an Israeli couple, and Anglophone and Francophone passersby. This woman grew up in New York City, where her grandmother had worked in a garment factory. We were able to share our family histories across time and national borders. New Demands? was also inspired by my own family history. Three of my four grandparents worked in the garment industry in Montreal during the years 1910-1965, mostly in the factories in the area where my performance took place.